Test of Hypothesis: The "Sample"
Much time and/or efforts consuming as populations are normally huge. Impossible if the population is infinite (such as products). Here comes the role of taking samples. Yes! we just take a sample from the whole population, perform the study on the chosen sample, apply the results back to our population. This is the core of inferential statistics because what we do is to infer parameters/properties of the population using information from a small sample. Well, this does not mean we will obtain 100% exact accurate estimations or inferences. But to be as close as possible, sample elements should be taken randomly! 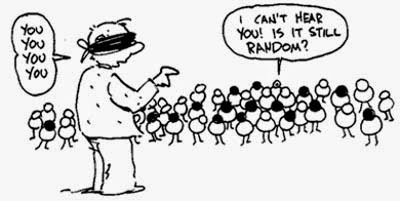 At least, being random in sample selection will mostly include the diversity of information/facts within our population.